Quick, what cities are the North American leaders in bike sharing? Montreal, Washington and, soon, New York City, right? Mexico City launched a bike share system (Ecobici) in early 2010 with 70 stations and over a thousand bikes. After seeing a very small expansion in 2011 (15 stations), the system will finally receive a Phase 2, which is to be installed this month. Membership is limited to annual subscribers, so tourists cannot use it. On top of that, the system has a member limit, which until now was 30,000 (sold out). The new member limit will be 73,000, eventually increasing to 100,000. Of course with 10,000 bikes, New York City bike-share will have Mexico City beat, by a lot, when it gets going in the spring. But 4,000 bikes is nothing to sneeze at. 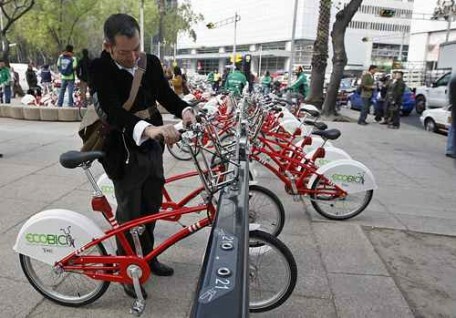 It would make Mexico city the seventh largest bike-share system in the world. Elsewhere on the Network today: Taking the Lane explains why sharrows are like ’90s underachieving teenage television dreamboy Jordan Catalano. Seattle Transit Blog laments the city’s habit of making good sustainability plans, then sabotaging them. And the Fast Lane discusses Amtrak’s steady upward trajectory.